C2S4CD2 I love The Black Crowes and I love Led Zeppelin but when I bought this I did it with a certain amount of reservation. 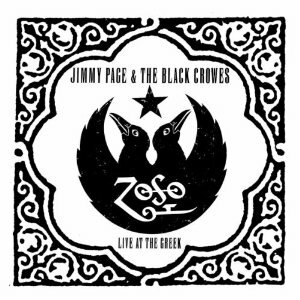 Why would it be a good idea for The Black Crowes to become a Led Zeppelin tribute band for the night? I know why they would do it, if Jimmy Page asked any rock band to be his house band for the night they would all say yes, why wouldn't you? But I suspect once they had said yes, it was followed by a few days of wow what have we done! Saying that they must be pleased with the results as they decided to release the concert. So what have we got here? 20 tracks 13 Zeppelin classics and 7 blues classics. The Led Zeppelin songs are at worst OK and at best good, Chris Robinson doesn't have the range of Robert Plant ( not many people do!) but he carries off the songs in his own style without trying to impersonate Plant, the band are tight and Jimmy Page does what he always does adding beautiful guitar work to all the songs. Of the Led Zeppelin tracks Ten Years Gone and the opening Celebration Day are the best but really if you want Led Zeppelin then go buy a Zeppelin album. The interesting stuff is the non Zeppelin stuff when the Crowes and Page get stuck into some classic blues, you can see them relax and really start to enjoy themselves. It's no secret that Zeppelin were heavily influenced by the blues and at some point even pinched some of the blues classic for their own, but you can feel Jimmy Page's love for these songs in his playing he really steps up a gear and lets fly as the structure of playing the Zeppelin songs is removed. Willie Dixon's songs feature heavily but it's the cover of Peter Green's Fleetwood Mac Oh Well, that just sizzles. Chris Robinson's vocal are great and Pages guitar work is just amazing. This isn't a Black Crowes album nor is it a Led Zeppelin album but what this is a group of very accomplished musicians having a great time and allowing us to experience it with them. There are better Black Crowes and Led Zeppelin albums but this is a fun album which is worth a listen if you are a fan either band or if you like your blues on the rockier side then their is much to like on here as well.